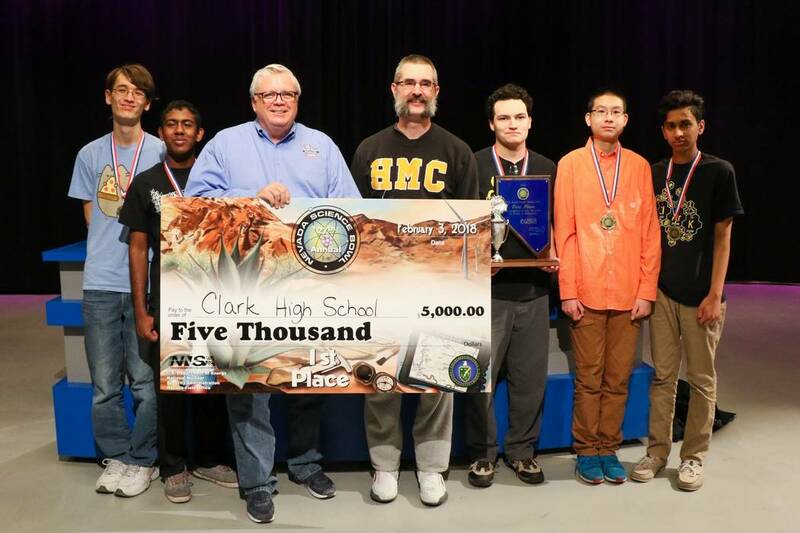 A new team of high school students will be crowned champions of the 28th annual Nevada Science Bowl competition Saturday, Feb. 2, an event featuring competitors from Pahrump Valley High School. National Nuclear Security Administration file photo This file photo from last year shows team members who won first place in the Nevada Science Bowl on Feb. 3, 2018. Left to right: Alex Bean, Anish Kalakuntla, Darwin Morgan, director of public affairs for the U.S. Department of Energy National Nuclear Security Administration Nevada Field Office, team coach Chuck Bean, Brennan Ferrington, Jeffrey Luo and Jay Desai. First-prize titleholders are awarded $5,000 and will advance to the National Science Bowl in Washington D.C. April 25 to 29. Details were announced Wednesday in a news release from organizers. Competition heats begin at 7:30 a.m. Saturday, Feb. 2, at 3050 E. Flamingo Road, with the grand-prize announcement at approximately 5:30 p.m.
Students will answer questions from science, technology, engineering and mathematics fields in a fast-paced, question-and-answer format throughout nine rounds. Local weathercaster and news anchor Nathan Tannenbaum will host as master of ceremonies, moderating the final round of competition that will be broadcast on Vegas PBS. The top 12 teams will receive cash prizes for their school’s math and science departments. Each year, more than 15,000 students compete nationally for the opportunity to represent their school at the U.S. Department of Energy’s National Science Bowl, the largest and most prestigious science competition in the country. Sponsors of the 2019 Nevada Science Bowl include the U.S. Department of Energy (DOE) National Nuclear Security Administration Nevada Field Office (signature sponsor), Mission Support and Test Services LLC, Environmental Management Nevada Environmental Program Services, Bureau of Reclamation, Nevada National Security Site contractor SOC, and Navarro and contractor JGMS. News media are welcome to cover the Nevada Science Bowl. Access to the competition, students, coaches, parents, volunteers and spectators is permitted. Follow the progress of Nevada Science Bowl on Facebook and Twitter using #NVScienceBowl. A registration and welcome session is planned for today, Friday, Feb. 1, at the National Atomic Testing Museum, 755 E. Flamingo Road in Las Vegas.